Over 30% of Canadians are walking around without any kind of life insurance. There are many reasons for this – they don’t know where to start, it isn’t a priority, or in many cases, they have a health condition or a negative health history and think that it would spike life insurance premiums into an unaffordable territory. There are three tiers of life insurance, and every Canadian can be covered by products available at each of the three levels. Think of it as a funnel; at the mouth of the funnel, you have standard life insurance, which covers most Canadians. For this type of insurance, you generally need to have medical tests and answer questionnaires; sometimes you are even interviewed by a medical professional. Then, when the funnel begins to narrow, you have simplified issue life insurance, and then at the neck of the funnel, guaranteed issue life insurance. Guaranteed issue insurance is the kind you see advertised on television with “no medical tests” and “guaranteed acceptance”. This is generally as advertised, and anyone can be covered regardless of any health conditions or negative health history under guaranteed issue. The only tradeoff is premiums, which are naturally higher since the policy is riskier for the insurance company. Simplified issue life insurance is the tier in between “regular” life insurance and guaranteed issue life insurance and will require a medical questionnaire without the medical tests that you may have with “regular” life insurance. Premiums for this tier are generally less expensive than guaranteed issue but can be more expensive than a “regular” life insurance policy. Every application handled through Kennedy Insurance starts off with standard life insurance and then works through other forms of life insurance from there. If you’ve had something like a heart attack or cancer, you can actually qualify for “regular” life insurance after you have been disease-free for a certain period of time. If you are a tobacco smoker (cannabis-only smokers often qualify as a non-smoker) you may qualify for regular life insurance at a higher premium if you are otherwise healthy. We will always get you the best product you qualify for as your broker. If you don’t fit into the bucket of standard insurance, or don’t want to take the medical tests necessary to be bound under a standard life insurance policy, you will still qualify for affordable life insurance under a guaranteed or simplified issue policy. Some older seniors may have gone through their whole life without a policy and come to us looking for something that will pay final expenses. As far as life insurance policies go, a policy which is just meant to pay final expenses is a fairly “cheap” policy as you are generally talking about $10,000-$20,000 rather than $100,00-$1,000,000. These less expensive policies also don’t usually require any medical tests or other medical information. Long-term illnesses are best dealt with on a case-by-case basis. Of course, the best time to get a life insurance policy is before you are diagnosed, but many only think about life insurance when they are diagnosed with a terminal or degenerative illness. Generally, the life insurance company will quote on anything, but clauses exist within many policies that only allow for repayment of premiums after the first two years, which means you are just looking at a forced savings account and binding a policy may not be worth it. For a degenerative disease or an illness such as an easily treatable cancer, you may not actually be looking at the huge premiums you think you are. Larger than if you didn’t have the disease, certainly, but it’s still a conversation worth having. The last thing you want out of your life insurance is a “gotcha”. The media has covered cases in the past – usually banks insuring their own products such as mortgages – in which the insured was denied due to a medical condition, even though they were not asked any medical questions in the first place. Kennedy Insurance only deals with long-established insurers who don’t use “gotchas” in their no-medical insurance policies. Kennedy will also reevaluate your plan every year for its suitability to your current health condition. If we had to sell you a simplified issue policy because of a past medical condition, and the clock runs out on the time past your “all-clear” diagnosis, we can then put you into a standard life insurance policy with more affordable premiums. This isn’t service you will get straight from the insurer or, indeed, from all insurance brokers. You’re part of our family when you buy insurance from us, and we take care of you as if you were a family member. 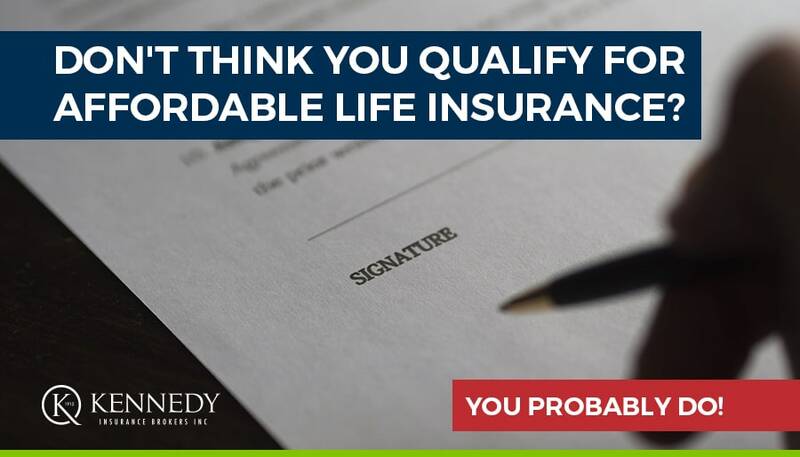 Contact Kennedy Insurance today to talk about life insurance options, even if you don’t think you can afford it. You may be pleasantly surprised!